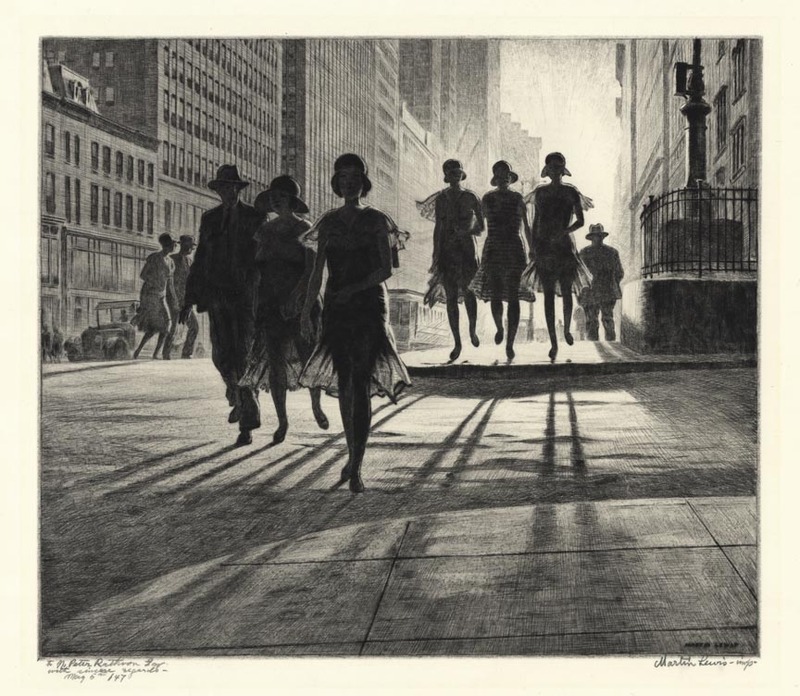 Martin Lewis is considered one of the greatest American printmakers of the first half of the twentieth century. 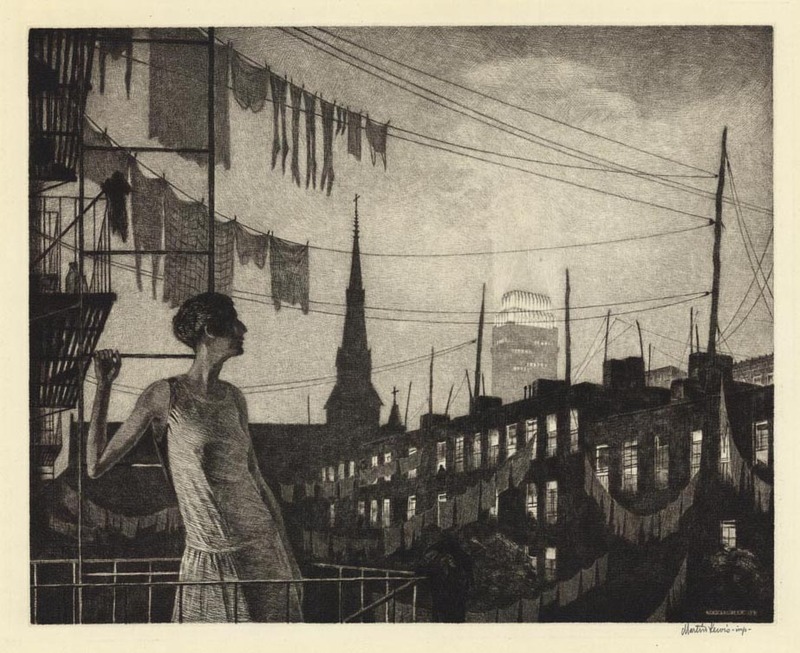 He used his superb sense of composition and his technical skill as a master printmaker to create images of New York City and rural Connecticut that are as captivating today as they were in the late 1920’s when he was first recognized as an important artist. He was one of the first printmakers to sell out an edition of a print during an exhibition, and many of his etchings and drypoints sold out in a few months. 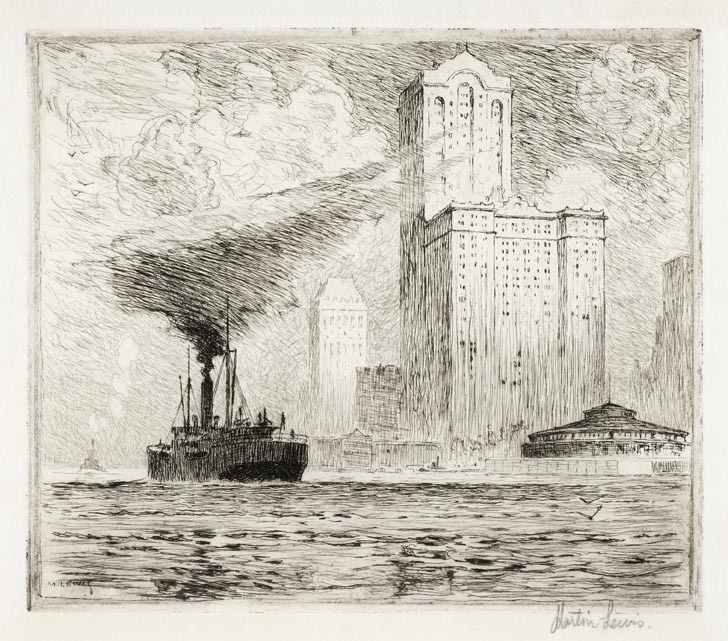 Martin Lewis spent most of his life living in New York City after arriving from Australia. However, he did travel to Europe and lived briefly in Japan and rural Connecticut. 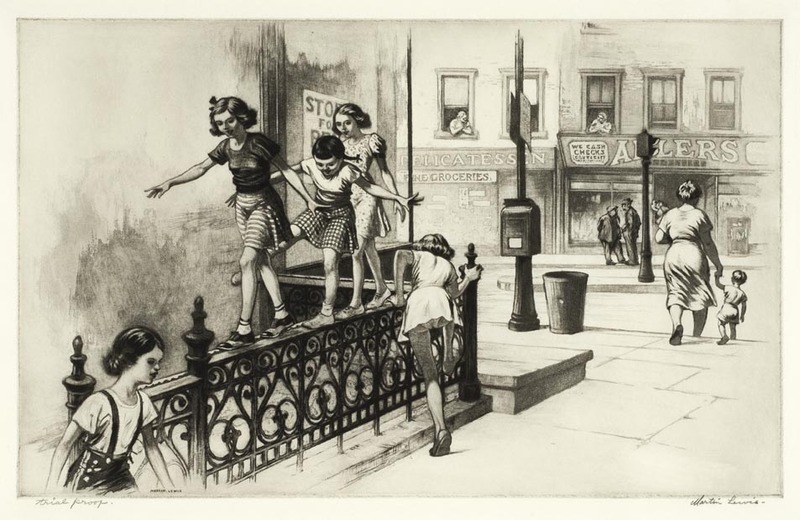 Martin Lewis was born in Castlemaine, Australia, on July 9, 1880, the second of eight children. His father Evan Lewis was born in Pembrokeshire, Wales, and his mother, Victoria Caroline Spice, was born in Melborne, Australia. Evan Lewis found work shortly after he married Victoria Spice on November 16, 1878, with Thompson & Co. Founders and Engineers in Castlemaine. The couple moved into a small cottage near the foundry. As the family grew they moved into a larger home the family called Sunnyside. It was at Sunnyside that Martin grew up. Evan Lewis had a steady job, but with many mouths to feed, the Lewis family was not rich. His parents instilled in the children the work ethic - that hard work was part of life. 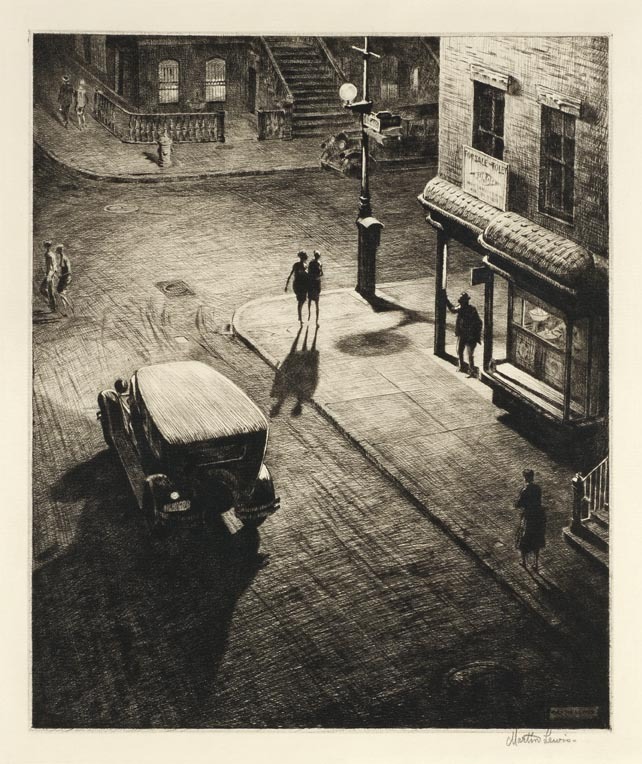 Martin Lewis showed an early aptitude for drawing and spent a considerable amount of time sketching everything. His older brother, Pembroke, did not feel that drawing was work. He felt Martin was lazy and wasting his time constantly drawing. When Martin completed eighth grade at the age of fourteen, he was expected to find a job. He eventually took a job with The Castlemaine Leader, a local newspaper. Lewis left one of his drawings on the editor’s desk one day. The art teacher from the Castelmaine School of Mines, Thomas Fisher Levick, came in and saw the drawing. Levick inquired who had drawn it and the editor introduced him to Martin Lewis who produced other drawings he had done. 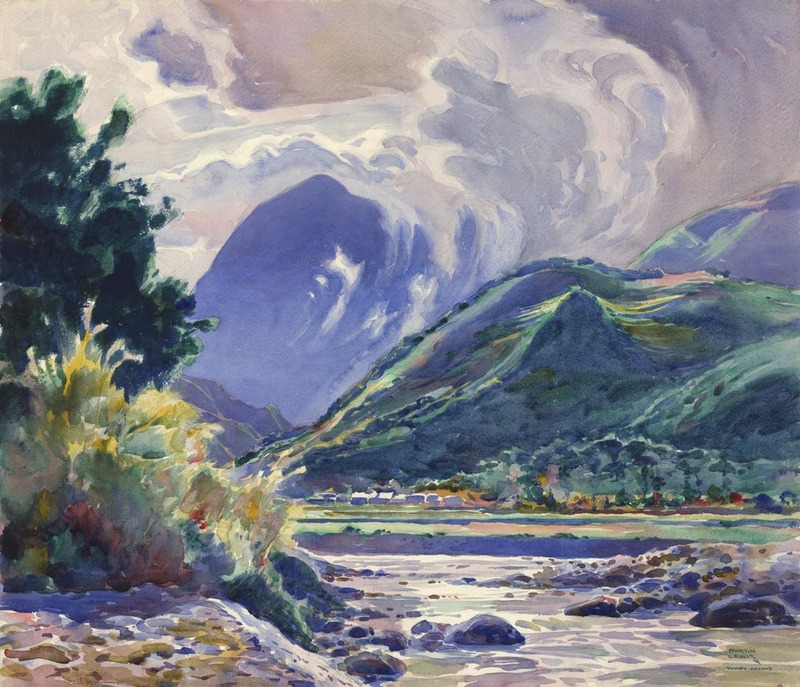 Levick was impressed by the young artist and offered his services as an art teacher. Lewis explained that he could not afford the fees for the classes and Levick offered to teach him for free. He enrolled in art classes on March 15, 1895. This represented the first formal art instruction he received. In 1898 after the death of his father and with increased disagreements with Pembroke about drawing, Martin decided to leave home. He traveled through Victoria and New South Wales, picking up odd jobs from time to time, eventually ending up in an artist “Bush Camp” in caves overlooking Sidney Harbor. For a brief period Lewis studied with Julian Ashton, a prominent artist and teacher in Australia. 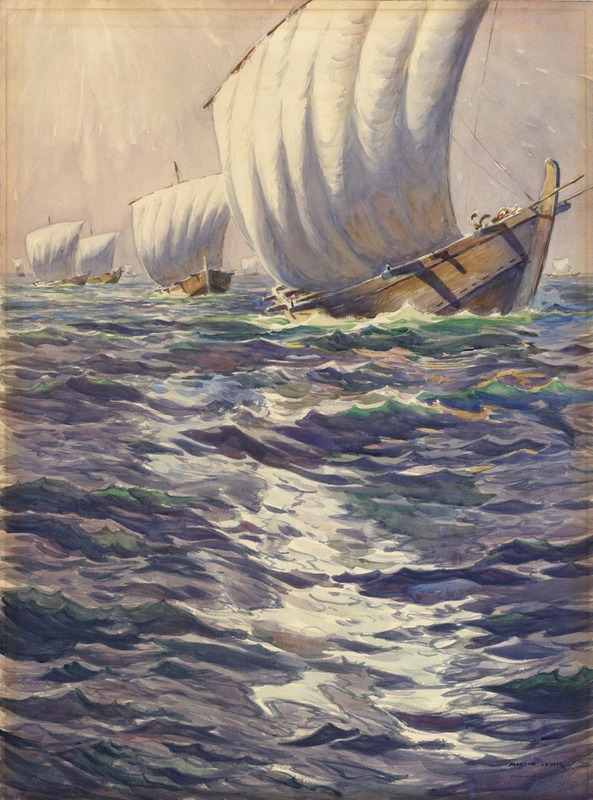 He had several drawings accepted as illustrations for newspapers and Paul McCarron believed he was exposed to printmaking by viewing old master prints during this time. At some point he was advised that if he wanted to become famous, he should go to the United States. He arrived in San Francisco in time to do stage decorations for the William McKinley presidential campaign of 1900. We know little of his travels between 1900 and 1905. Marilyn Kushner found he was listed as an artist in the New York directory in 1905. He was living on West 14th Street at this time with other artists. It is known that Lewis became a successful commercial artist during this time – his sense of design served him well. In 1910 he traveled to London and Wales, visiting his brother, Llewellyn, a priest, and his uncle in Wales. There is little doubt that he was exposed to printmaking. He became enamored with the work of Seymour Haden and was likely exposed to Whistler, Rembrandt, and other etchers. During this trip he also met Esta Verez, a singer. The two were together for the next decade. 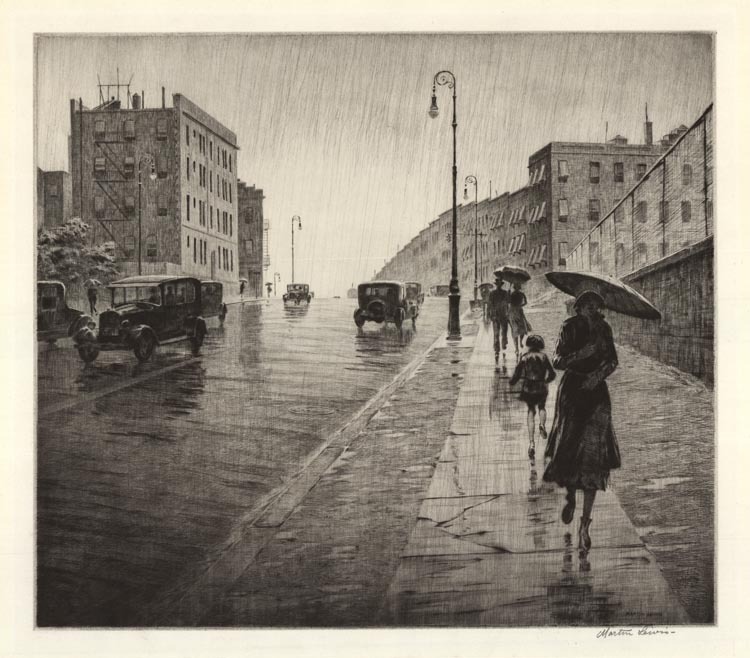 Officially, Martin Lewis first etchings date from 1915, although crude when comparing them to his work in the late 1920’s. They show a greater competence of craftsmanship than first etchings generally do. However, nothing earlier survives. Pictured to the right is his fourth etching, entitled The Battery, printed in 1915. One can see his understanding of composition in Dockworkers Under the Brooklyn Bridge, and his appreciation of Japanese art with Moonlit Farm Scene. It was in 1915 that Martin Lewis was asked by his friend, Edward Hopper, to show him the finer points of etching. Lewis’ circle of friends included artists, writers, and playwrights. In 1920 Verez and Lewis broke off their relationship. He was frustrated with not being able to break into fine art and out of commercial art and with a bit of a broken heart, Lewis left for Japan. His plan was to make this move permanent. The trip was important for the artist – he studied Ukiyo-E and other styles of Japanese art. 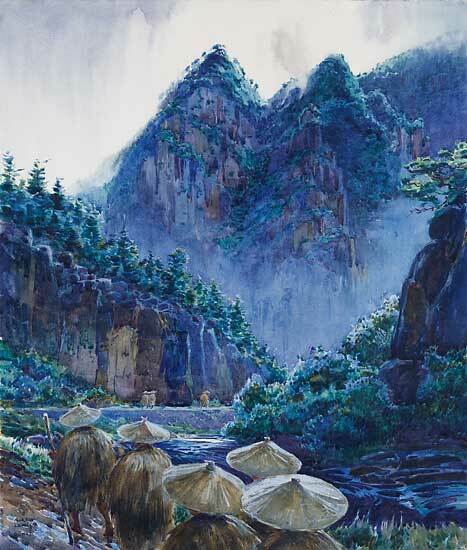 He did paintings, watercolors, and drawings every day. He did not work on any prints, but he refined his artistic vision. He was not working at a job, just working on art. Sixteen months later he was broke and arranged to return to New York. In Japan he used up his savings and his need for money meant he went back to commercial art for a while. In 1924 he began making prints again – His subjects were from his travels in Japan. The Downtown Gallery represented him briefly before Kennedy Galleries. His first exhibition at Kennedy Galleries was in 1927 primarily for his watercolors; he included a few of his drypoints as well. The drypoints sold well and caught the attention of Otto Torrington, the head of the Print Department at Kennedy Galleries. The next year he had an exhibition at Kennedy Galleries featuring his etchings and drypoints. The demand for his prints at that show was overwhelming. One print, Relics, sold out in four months at $28 each. A month later the gallery sold a trial proof of Relics for $100. From 1928 on Martin Lewis would concentrate his career on printmaking. Lewis met Lucile Deming through some literary friends: the poets Laura Benet, Lola Ridge and writers Evelyn Scott and Kay Boyle. They married in 1924. Martin Deming Lewis, their only child, was born on October 29, 1924. His birth certificate was listed as “Boy” Lewis because his father wanted to name him Hayden Seymour Lewis, but his mother would have no part of it. His father would call him Hayden for the rest of his life. His son officially changed his name when he entered the military during WWII. There is a lot of history to Martin Lewis’ career. He was an artist, taught at the Art Students League, and was a master craftsman printmaker. To see more work by Martin Lewis, please visit his artist section here. 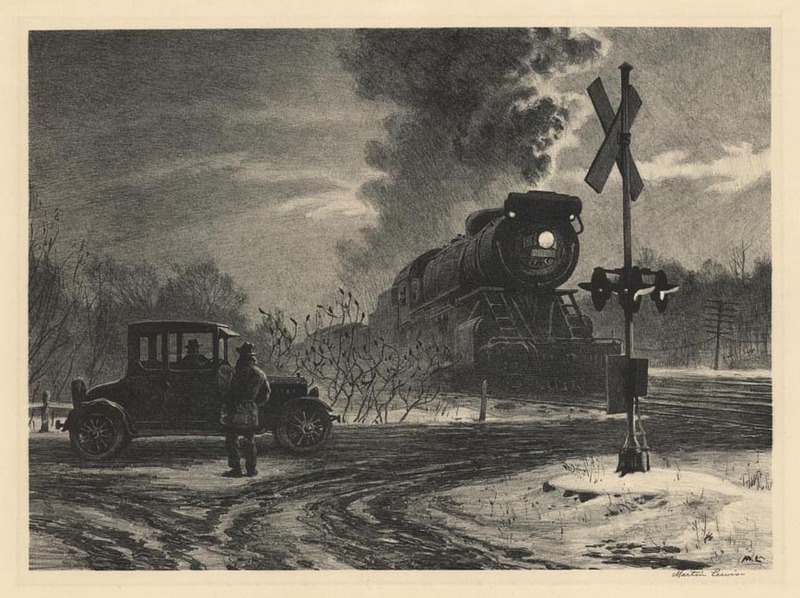 If you are interested in purchasing The Prints of Martin Lewis A Catalogue Raisonne by Paul McCarron, please click here. The Prints of Martin Lewis A Catalogue Raisonne by Paul McCarron.